Ages ago — ten years ago, in fact — I wrote about Japan’s high suicide rate. Today I came across a documentary on the subject that must have been made around this time, commissioned by Channel 4 in the UK, which someone uploaded to YouTube last year. 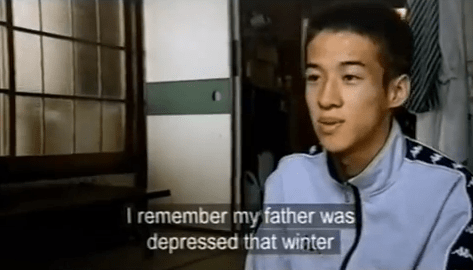 Following this search will take you to all five parts (with the somewhat misleading title of “Secret Life of Japan”), or you can watch Part 1 below and continue on from there. Not knowing anything about this film — and there’s very little information on the YouTube page aside from a (again slightly misleading) description, I assumed it was a Japanese made film (it’s completely in Japanese, with subtitles), yet couldn’t help but be surprised as it was quite unlike most Japanese made-for-TV documentaries I’ve seen. Alas, at the end the credits reveal that it indeed was not Japanese-made. Of course this is not to say it couldn’t have been made by a Japanese, but I honestly don’t think any of your Japanese networks — to say nothing of the average viewer — would have been comfortable with the way the subject of suicide was treated, and the honesty of the opinions and stories of the various interviewees. The documentary also avoids, for the most part, the overly maudlin and manipulative tear-jerkingness of standard Japanese TV fare. The lack of a comforting and distancing narrator forces the viewer to listen to the stories — of the victims’ surviving family members, of employees dealing with the loss of what they thought were lifelong jobs, of people who for one reason or another ended up deciding not to kill themselves — as it these people were in the room with us.